Patent for "Dynamic External Wrist Fixator"
This is an interesting invention, resulting from a collaboration between a team of engineers (structural, mechanical, metallurgical) of Calicut Regional Engineering College and a team of orthopaedic surgeons of Calicut Medical College. 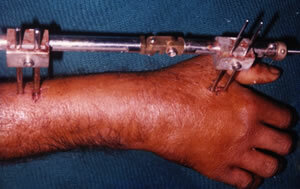 When the wrist undergoes a compound fracture (due to an accidental fall), it splinters into many fragments, which do not usually heal to the original condition. The problem is usually 'fixed' by means of an 'external fixator' (made of stainless steel) which is screwed to either side of the radius, while applying traction. 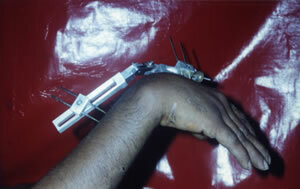 The hand is immobilised for a period of about six weeks, and the fracture heals naturally. However, invariably, there is a considerable loss in mobility of the wrist, as well as arthritic pain, and sometimes visible deformity. 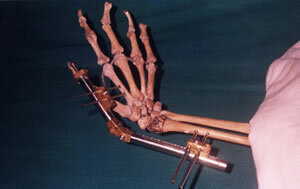 The challenge was to devise an improved fixator that would permit controlled mobility of the wrist, so that when the new bone forms and the fracture unites, the original flexibility of the wrist is retained to a large extent. This was successfully achieved by the new invention, which allows movement of one degree of freedom at a time, while arresting the other degrees of freedom. A large number of clinical trials have been successfully carried out at the medical colleges at Calicut, Trivandrum and Kottayam. 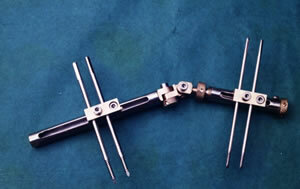 Please click here for a Press Report on the Dynamic External Wrist Fixator.